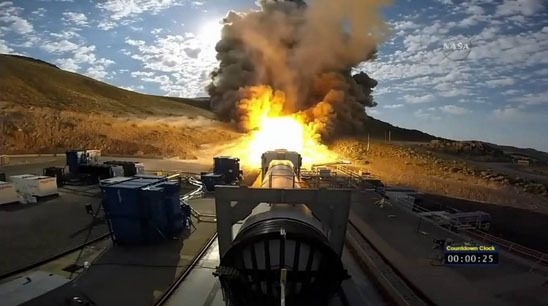 The American space agency successfully tested a powerful new rocket engine this week in the desert of northern Utah. The rocket booster is meant to take astronauts to the planet Mars one day. This was the second and last qualification ground test for what NASA officials are calling the "most powerful rocket in the world." NASA is short for the National Aeronautics and Space Administration. An uncrewed test flight of NASA's Orion spacecraft is planned for 2018. Manned flights could begin within years if that test is successful. Space agency officials were pleased with the results of the test. "This final qualification test of the booster system shows real progress in the development of the Space Launch System," said William Gerstenmaier. He is the associate administrator for the Human Exploration and Operations Mission Directorate at the space agency's headquarters in Washington, D.C.
Gerstenmaier said the new engine can produce 1.6 million kilograms of thrust, or force. The successful test shows the progress NASA is making in human exploration of space, he added. The American company Orbital ATK conducted the test for NASA. The 47-meter booster rocket engine was tested in a horizontal position, sending fire across the test area. The test itself lasted only two minutes, but that was enough for NASA to collect data about 82 different areas of the engine's performance. It is part of the process to certify the booster for flight. The booster is part of the Space Launch System NASA officials are developing for space flight. They say two boosters and four main engines will be used after the system is fully developed. Those engines will produce more than four million kilograms of thrust, enough to lift a large rocket off of Earth and toward Mars. But sending humans on a flight to the Red Planet is still many years away. NASA says a manned trip to Mars might start sometime in the 2030s. Something akin to panic swept the National Aeronautic and Space Agency. I should like to add that we are pleased with the result. If computers had not been invited, many problems on space flight could not have been solved. The island nation has announced that it hopes to initiate manned flights to the moon by 2025. 1.Those engines will produce more than four million kilograms of thrust, enough to lift a large rocket off of Earth and toward Mars. Margaret needed support more than ever. Rob likes apples more than bananas. 2.The 47-meter booster rocket engine was tested in a horizontal position, sending fire across the test area. He has worked with IBM for two years on numerous start-up products in the software development and test area. Testing Embedded software is a hotpot in nowadays computer software test area.